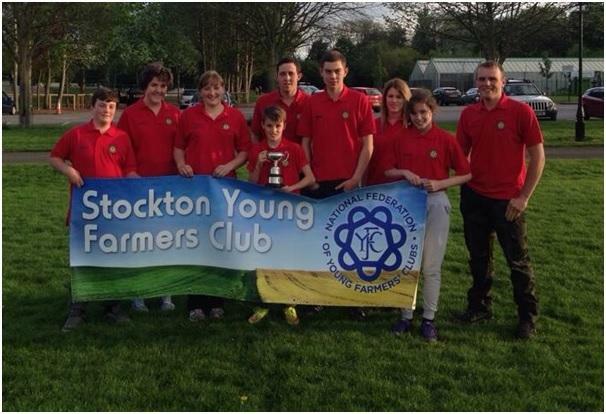 On Saturday 9th May, Stockton YFC hosted the annual County Durham Federation of Young Farmers’ Clubs Rally Day. The event was held at the fantastic Middlefield Farm venue in Thorpe Thewles. The day is an annual event and is an action packed day of competitions for members of all 9 YFCs in County Durham with a social event in the evening. The day kicked off with Machinery and Fencing for some while other members displayed their exhibits of cookery and craft in the hall for judging later in the morning. Other competitions included Log Saw, Bridle Identification, Mystery Judging of Hounds & Working Dogs, Sports, Tug of War and a Bush tucker Trial style eating competition. The County Durham members are a competitive bunch with all competitions being awarded points towards to large selection of beautiful trophies that are up for grabs. Stockton YFC took on the challenge of hosting this year’s event with gusto and the small but mighty club, which very nearly closed only 2 years ago, ran a superb event that will be one to remember. Not least for the Club themselves as they also successfully competed on the day to win the Best Small Club Trophy for the first time since 1976! Rally Day is a real county effort. Around 80 past members, friends and family were invited to judge and steward all the competitions on the day and local machinery dealerships Ripon Farm Services and Russels generously provided the Machinery needed on the day. Members who have been successful in particular qualifying competitions will go forward to compete against other Northern Area Counties such as Northumberland and Cumbria at the Northern Area Field Day at the end of June whilst others will also be going on to compete at the National YFC Finals. The overall winners of the County Durham Rally were Staindrop YFC. For more information on any events or how to join contact durhamyfc@btconnect.com.